We need to play. Through the act of play, we critically investigate the world around us, seeing not just what the world is, but what it has the potential to become. We appropriate our surroundings, creating new worlds with new possibilities. By playing, we gain the confidence and ability to freely express ourselves and reshape our world. And yet, more often than not, the tools, machines, and systems with which we surround ourselves are deliberately designed to restrict our ability to play with them. Instead of creating technology with a multitude of functions, that encourages improvisation and creativity, our tools often have one or two limited functions. Rather than creating systems which are transparent and open to investigation and manipulation, modern systems and tools are intentionally opaque. Instead of designing machines which allow their users to be active participants, we are relegated to being passive operators. In order to confront this problem, I embarked on a series of work called PlaylGround. This body of work re-envisions the technological paradigm, presenting machines that are playful and open in both design and function, encouraging investigation and manipulation of the machines. In this way, PlaylGround suggests a relationship between play and technology that is cooperative rather than antagonistic; a model for tools and their users that is empowering instead of restrictive; and a partnership between the manufacturer and the operator that is collaborative, not authoritarian. Teeter is one of the machines of the PlaylGround. By playing on the mechanical teeter-totter, participants charge a massive flywheel. Thus, Teeter is activated and powered by the act of play, rendering the metaphorical “energy” of playfulness literal and very physical. It literally stores this energy in the flywheel, and, while it does not use that energy for any specific task, it invites the user to consider what tasks it could be applied to. 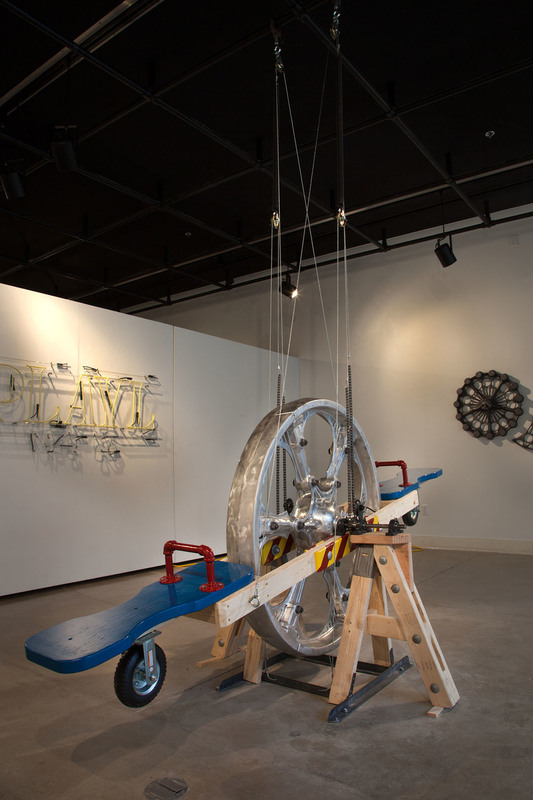 Like all the machines in the PlaylGround, Teeter exists both in a finished/display form (as seen in the gallery) and as a kinetic sculpture kit. The finished form is a site-specific installation, incorporating the particularities of the space into its structure. It is built using the Teeter kit, which includes special cast aluminum mechanical elements, important hardware, and exploded diagrams to aid in assembly. The goal is to add another type of play to the sculpture: the play of creation. Like a Lego or Erector set, the kit invites galleries and collectors into a collaboration with me, taking my vision for the piece, playing with it, and ultimately making it their own.